Back to poor Kono now. Why does she get the crummy jobs? First a nekkid stoner, now Sang Min in a ‘revealing’ bathrobe. 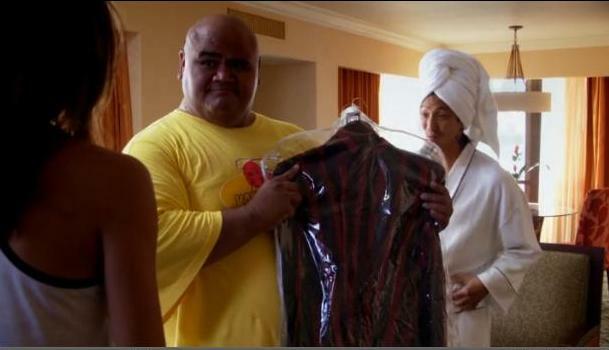 Sang Min has ordered room service in the hotel where he is holed up AND has sent Kamekona to bring him some new clothes for his court appearance. That Kamekona, he’s always on the scene when a witness is being babysat in a supposedly safe location! Back at HQ, Eric is totes impressed by Danny’s working environment (beats mine for sure!) and the “bitchin’ computer.” Danny and McG are totes UNimpressed by Eric fiddling with their bitchin’ computer, though. Chin then presents us with further information on The Red Herring, the student seen by Roth leaving Cutler’s office in tears. Her name is Rebecca Fine. As an aside, an old picture of Danny is emailed to Chin and McG from Danny’s email account. Danny, hilariously, is Mr November in the 1998 Newark Police Academy Calendar. The look on McG’s face when he laughs at the picture is priceless. It turns out Eric is the culprit and Danny is not happy. Hey, Danny, perhaps having your teenage nephew at work with you isn’t such a good idea after all! Next up, McG and Danny, with a sheepish Eric in tow, head to the sorority house to interview Rebecca Fine. Despite the fact that the scene is sort of pointless because it’s about The Red Herring, it is quite funny. Here’s why: (a) one of the college girls thinks that McG and Danny are a couple. She says: “Kelly, your Dads are here to pick you up”. Dads? 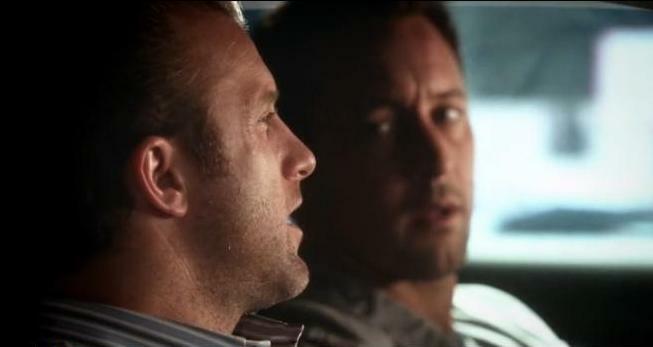 McG’s face is priceless! He says, “I’m sorry, you think I look old enough to be her father?” Danny: “That’s the part you bumped on?” Hilarious. Also, (b) Rebecca evades questioning by taking off on a pink scooter. A pink scooter? She obviously hasn’t seen the way McG drives! Even more hilariously, the boys are driving at 29mph next to Rebecca who is putting along on her pink scooter, refusing to pull over. I giggled at that bit, although I wasn’t so sure about her being run off the road and thrown into the Blue Room. Anyway, it turns out that Rebecca had gone to Cutler over exam cheating allegations and he had promised to look into it. Luckily for Rebecca, she is spared further questioning as evidence comes to light that excludes her as the killer. Oh, and the fact that she is The Red Herring. However, McG and Danny are still pursuing the cheating angle as, even if Rebecca is ruled out, there may be other students who were involved (and were big and strong enough to commit the crime). Remember, too, that a male student is Door Number 3. At Eric’s suggestion, they find a kid whose grades have suddenly improved and he is hauled out of an exam. Cheater Kid tells the boys that he bought exams from Cutler’s TA, Door Number 2. A chase ensues and for the second time this episode, a suspect stupidly thinks they can get away from McG and Danny. The TA is tackled by McG, after a nifty jump over a bike rack, which is hilariously captured on nearby students’ phones. Hey, McG, you’ll be on You Tube later! By the way, were the TA’s ribs really in mortal danger? He said he could hardly breathe but McG and Danny completely ignored this. Being a suspect on H50 is no fun at all! Steve jumps over (anything) and tackled the bad guy. Danny handcuff the bad guy. Same action different week. OMG! THAT WOULD BE HILARIOUS! I think they *surprised* Alex in that scene with one of the many photo manips available online of a very naked and *excited* Scott Caan. nice. his face sure seemed rather genuine! so good. i love the bromance, i admit it. So much funny in this ep. I loved the bit about the Danny pic and the Scooter chase! And I split a gut over the Sang Min robe fiasco …poor Kono having to look at everyone’s nekkid junk except Steve’s!! That girl deserves a raise!! “poor Kono having to look at everyone’s nekkid junk except Steve’s! !” – GOOD POINT!! poooooor Kono. She can’t handle Lt. 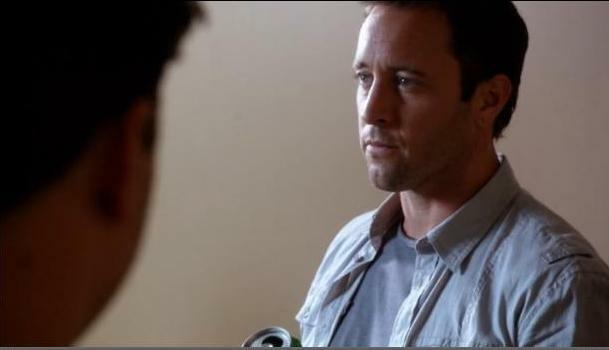 Commander Steven J. McGarrett’s junk!!! That’s a solders job. That didn’t come out the way I meant it….yes it did!!! Who am I trying to kid? Should we start calling her “Neo” ? does doing one of those exercise boot camp classes count? if so, i’m your man. Only if it was S.x Bootcamp McG Style. crap. they don’t offer that at my gym. i wonder where to sign up…. ..oh and it was absolutely flippin hilarious that Steve was more offended about being thought of as old than of being Danny’s ‘partner’!!!!! LOVE that scene!! I don’t think Steve is vain, if he was he would be walking around naked, the way he was meant to be. Naked with a Batman belt to hold his gun, phone, badge, extra ammo clips, spare camaro key, a grenade, and cuffs. Naked. he used to be a helluva lot more nekkid, or at least shirtless. how do we, ahem, encourage TPTB to reinstitute shirtlessness? Yeah…at that point the belt would be a real scooter. Batman or not. sorry. that’s a sort of texas-style version of naked. imagine, i dunno, willie nelson, or worse, george w. bush, saying “naked.” just having a little fun. Haha I loved that too!! LOL, I would love to see those YouTube videos & pics uploaded to Instagram of McG taking down the TA. ^^^EXACTLY what I was thinking!!! ^^^ Where is the YouTube vids of this?? huh? Where?? EXACTLY!! I was waiting for that to show up later in the episode!! I hope that didn’t all end up on the cutting room floor! Maybe we’ll see it in another episode – the Governor gives them hell for being internet sensations?